The nerfs that accompanied the release of Gods master mode with 5.10 were an absolute godsend for us. Not only did we finally get the sisters down, but we then managed to progress through the Nahut and Scyva fights at a good pace as well. After that we suffered a temporary setback mostly due to some people leaving and us having to reshuffle teams, but this last week we finally polished off the operation in full by knocking out Izax as well. Onwards to master mode next? Hell no! Considering how much we already struggled with the un-nerfed veteran mode, Gods master mode clearly wasn't made for the likes of us, not now or maybe ever. Not to mention that there are some old bosses that we still haven't killed yet (at level or ever, such as Dread Master Brontes on master mode) so there's still plenty of (relatively) easier content left for us to tackle first. + Interesting boss fights: Generally speaking I liked all the fights in Gods from the Machine. They are all interesting, featuring a number of fun and novel mechanics. My favourite boss is probably Nahut, simply because everything about him - from concept to execution - is so cool and the fight is relatively easy to learn too. I like that most of the time where more involved mechanics come into play, it's usually good enough to have one or two people learn how to deal with them, while less skilled players or those who are simply new to the fight can focus on just fulfilling their basic tasks. It's a good design philosophy that I remember seeing discussed in other contexts before and I still agree that it's probably the best way to design a raid boss. + Great trash: I'm overdue for making another one of my "outtakes" videos in which I compile funny moments I captured with my guildies, and just based on what's accumulated in my videos folder, about half of it is going to be about Gods from the Machine trash. Especially on hard mode, it's just incredibly entertaining! There are those droids that cause a huge explosion if you interrupt them, the stealth mines, the weeny adds that like to swarm you... it's just entertainment for days. Sometimes it even teaches you something about what lies ahead, such as how to work the tethers that you pick up during the Izax fight. - Too much, too long: While I think that the trash is fun mechanically, even I have to concede that there's just a bit too much of it, especially between Nahut and Scyva. I think this is a side effect of the way the operation was released: With each boss making their debut one at a time, I guess it would have felt weird to not release each one with their own dedicated trash packs and mechanics. And it was fine when completing the operation for the weekly quest only required you to kill the first few bosses, but now that you're always clearing the whole thing, it honestly feels like a bit of a drag. 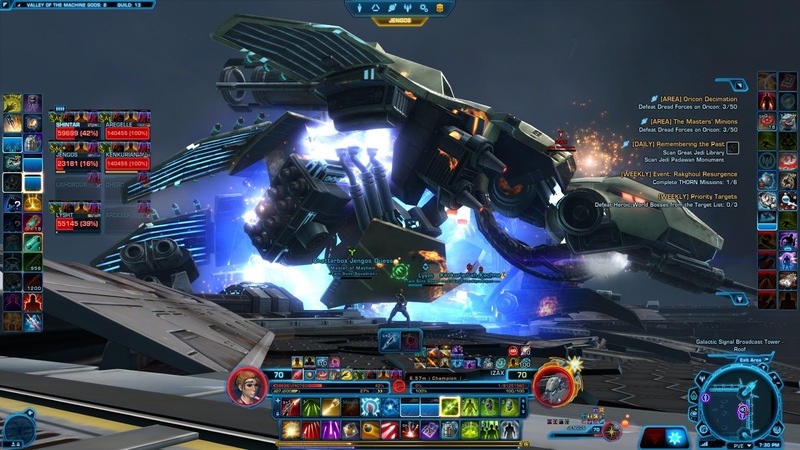 The length of the boss fights themselves also contributes to this, as with the exception of Tyth each fight takes about ten minutes, with Izax taking a full fifteen. I guess the logic here was similar to what gave us all that trash, that the devs wanted to make sure that each fight would feel "meaty" enough when released on its own, but it just makes the operation as a whole feel incredibly long, even when you know all the fights and are proceeding through the whole thing at a steady clip. I'm okay with the very last boss of an operation (and only that one) taking ten minutes to kill, but it shouldn't be the normal duration of a boss fight. - Tuning: I think the nerfs they eventually made to veteran mode were great, but how many guilds who were in a similar position to mine were even still trying at that point? I also still don't know what they actually changed about story mode because I don't think I've gone back in there since 5.10. The common opinion to avoid pugging it doesn't seem to have changed so far. And that's just not how it should be in my opinion. Story mode should be easily puggable. Releasing Gods with "hardmare" tuning was a mistake in my book, as it made the operation a hugely off-putting experience for everyone trying it on their "usual" difficulty. Even if later nerfs have helped to bring things more in line, Gods has a bad reputation as a destination for more casual players now and will probably maintain it for some time to come, which is a real shame because as I said there are some fun fights in there. We'll see if Bioware has learned any lessons from this and if we'll see them put those into action any time soon (new operation coming with the next big content release maybe)? My guild is ready at least. Meme thing I made when we first killed Izax on story mode. Congrats on the kill! How would you compare HM Gods to other ops? From the folks I raid with, I don’t sense much enthusiasm for venturing in there on HM. As for SM, I’d say it’s mostly puggable if a decent percentage of the group know the mechanics and are willing to explain them. In the pugs I’ve done, Nahut seems to cause a lot of trouble, but if the tank knows what to do and the dps know what to fight and what to avoid, it isn’t too bad. Scyva’s Extinction Protocol will still kill half the group, but she can be finished off short-handed. Post-nerf Izax is much easier. Phase 2 is the real challenge, but the beach ball phase is a breeze now. As long as folks can understand were to stand and when to move throughout, it’s doable. I wouldn’t say it’s significantly harder than Ravagers or TOS now. As for the trash density, I completely agree. Getting to Scyva without steath CC is a drag. It’s the one thing that keeps me from wanting to run it more often. And every time we skip the short cut mini-boss, Scyva is a wipefest, and every time we kill it, it’s a one-shot. I think as a whole, Gods is still the hardest VM operation currently in the game, even after the nerfs. There are a couple of individual fights that are still harder (I'm mainly thinking of VM Revan and Master & Blaster) but unlike in Ravagers and TOS, there isn't a single truly "easy" kill in Gods VM. In terms of motivation, it also doesn't help that the difficulty is somewhat front-loaded, with both Tyth and Esne & Aivela being quite wipe-tastic in different ways. Once you get both of those fights down, the rest definitely feels a lot more doable (but one's group doesn't necessarily know that). The Scyva mini-boss actually appeared to be bugged on VM - or at least that's what I heard someone claim after it kept wiping us within seconds. We eventually gave up on even trying to kill it; as for some reason it was deadlier than the boss herself and trying to kill it was just wasting time. I am quite curious as to "what comes next" in terms of lessons learned. In particular when compared to other MMO's and their more recent raiding visions. e.g. top-tier requires ritalin-level focus, while the rest should only need 80% of the folks to show. 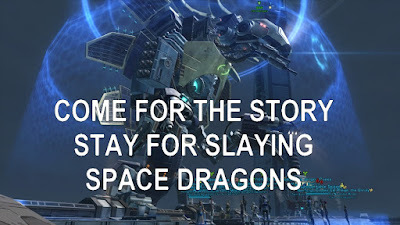 I think it's hard to compare SWTOR's raiding to other MMOs in that regard because I'm not aware of any others that don't allow add-ons, and that makes a huge difference. 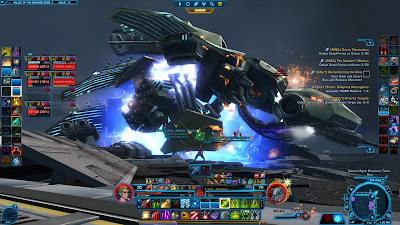 Many fight mechanics in SWTOR's operations would be positively trivial in a game where you could design an add-on to simply tell you what to do, but having to figure things out on the fly makes things quite challenging. For example I don't know if you watched the video of the fight that I linked in the main post, but one of the biggest challenges for us was simply the phase with the long-range missiles near the end since we all had to look at the sky to see where they were coming from, recognise the pattern in their approach and then quickly deduce from it which part of the floor was safe to stand on.